In a nearly analogous situation with the toner cartridge plot–the US taking credit for foiling an AQAP plot largely thanks to a Saudi-run agent–the White House had a big announcement, including an appearance from the President. I’m not certain, but news of the plot first came out of the UK, where officials intercepted one of the two bombs in East Midlands Airport (the Beeb did a timeline of the news as it rolled out; the times are 6 hours ahead of ET). Reports of two planes being searched–in Newark and Philadelphia–came out in late morning. Then Press Secretary Robert Gibbs issued official statements on the plot. In mid-afternoon, the White House announced Obama would make a statement at 4:15. Obama spoke, followed by Gibbs offering a chronology of the government response to the plot (which notably neglects to mention that Brennan first found out about the plot from Saudi intelligence head Mohammed bin Nayef). 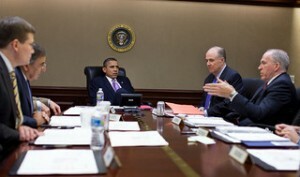 The White House even released a picture, above, purportedly of Brennan briefing Obama and others in the situation room, though not matching any of the meetings Gibbs described at the presser. And then Brennan answered questions, as he has with other national security ops. Not surprisingly, Brennan’s briefing doesn’t mention Jabir al-Fayfi, the former Gitmo detainee who had flipped and infiltrated AQAP under Saudi control, and had just returned to Saudi Arabia 13 days earlier and tipped the Saudis off to the plot. But the briefing also pointedly avoids mentioning the Saudis–or their role providing the tracking numbers for the packages–at all. Q Mr. Brennan, if you could talk about what we know beyond the fact that this was from Yemen, there are people in Yemen with AQAP who want to harm us — if there is more that can be established to create a direct link beyond the country of origin? MR. BRENNAN: I think, as Robert said, this is an active and ongoing investigation. We are working very closely with our partners in Yemen and United Arab Emirates, as well as in the United Kingdom and other countries, as well. Q I wonder, Mr. Brennan, if you can back that tick-tock up just a little bit. What did you know at the time when you briefed the President last night? And were these packages just discovered through random screenings? Or was there something that tipped you off to these packages? MR. BRENNAN: Well, I knew enough last night to be able to brief the President, number one. Number two, I think the American people should feel particularly good that since 9/11, the U.S. government has built up a very, very capable and robust intelligence, law enforcement, homeland security system. And as a result of the strength of that system, information became available that we were able to act upon very quickly and that we were able to locate these packages. So I’m not going to go into the details about how we became aware of it. But the redundant layers of security, the tremendous work of the counterterrorism professionals, law enforcement, homeland security, intelligence, was the reason why we were able to succeed. Q If I can just follow up on that — you’re saying then that you were aware of this plot not because of the packages but because of something else? MR. BRENNAN: I’m saying that whenever you pull a string, there’s a reason why you start to pull that string. And we had a reason to pull it. And as a result of what we were able to uncover in East Midlands Airport, with the very strong cooperation of British authorities, we were able to also then take additional steps. And that’s why those prudent measures were taken today to ensure that we were able to identify any other packages that might be out there of concern. Q Can I get someone to clarify — and it follows up on Ann’s question — with the packages themselves, what made the packages suspicious, or something else led you to the package? I guess Brennan has gotten worse at hiding the involvement of Saudi infiltrators in AQAP plots. Too much practice leaking secrets, I guess. Oddly, it appears the Saudis–and possibly Mohammed bin Nayef himself–revealed their role in the Saudi press within two days (as they had publicized the return of al-Fayfi). Brennan also rolled off the same kind of generic statement he has made numerous times, including a number of times since UndieBomb 2.0 was revealed, vouching for the always better than ever before Yemeni counterterrorism cooperation. Q And a quick big picture — the Yemeni cooperation — considering this is now multiple attempted terrorist attacks it looks like emanating from Yemen, is it fair to say that we don’t have the best cooperation yet with the Yemeni government? MR. BRENNAN: I would say that over the past 22 months or so, during this administration, and even in the prior administration, there has been a steady improvement in that cooperation. I would say that the CT cooperation right now with Yemen is better than it’s been ever before. That doesn’t mean that it can’t improve more. It needs to improve more. I’ve been out to Yemen four times during the past two years. We’re working very closely with them. And we found that they are courageous partners. Many Yemenis have lost their lives in the battle against al Qaeda. We are working very closely with the Yemeni government, and we’ve been able to make some significant progress against al Qaeda in the Arabian Peninsula inside of Yemen, working with those partners. Overall, Brennan created the illusion that we discovered this plot through American intelligence and quick response, not a phone call from Mohammed bin Nayef reporting on the intelligence he got from the former Gitmo detainee he had flipped. Now, I explored all this to show how utterly absurd White House pique at AP is, on its face. Given the opportunity, it seems clear, they would have rolled out a similar dog-and-pony, hiding the Saudi role in this plot, particularly that of the Saudi infiltrator, while celebrating the intelligence success of the US. So why is John Brennan so cranky at the AP? I wonder if Sir John, Blabbermouth of Brennan’s toes are getting a wee bit toasty as the FBI investigation heats up? @MadDog: FBI investigation isn’t going anywhere besides a series of really uncomfortable briefings. I wish it would, but it’s not gonna. Not least bc the FBI can very conveniently blame it all on foreign sources, which is at least partly true. @emptywheel: Do you mean FBI Director Muller will be left holding the empty bag? Heh! Two Republican congressional leaders have asked the FBI to examine whether White House officials may have inadvertently fueled news leaks which disrupted a Western intelligence operation targeting Al Qaeda’s Yemen-based affiliate. On Monday, Rep Peter King, chairman of the House Committee on Homeland Security, requested that an FBI investigation of alleged leaks cover the White House, including the National Security staff, according to a letter which King sent to FBI director Robert Mueller. Later on Monday, Sen. Saxby Chambliss, vice chairman of the Senate Intelligence Committee, faxed a similar but more specific request to Mueller. A representative of Chambliss’ office said that the letter referred to a Reuters story from last week, which disclosed that a briefing by a senior White House official may have inadvertently tipped the media to sensitive information about an undercover informant who played a central role in the case. Today’s story of a woman on an international flight claiming to have a device surgically implanted in her body (the assumption being ‘bomb’) made me think that another US government roll out was in process. However the papers are already claiming it was not terrorist-related. That of course didn’t stop the politicians from reminding readers that this method of al Qaeda terrorism was predicted. The above article (tomorrow’s date for some reason is in the link name), mentions two doctors on the airplane examined the passenger and failed to discover any recent surgical scars. Did the airlines really need doctors to do that? Did they have to perform a body cavity search after failing to find a surgical scar on the skin? It also begs the question, if this search was happening inflight, and if she had been the real McCoy, what then? Would the doctors know how to disarm her bomb? I’d want to stop a ticking bomb, but I wouldn’t be so sure that by clipping wires I’d be achieving my aim of preventing an explosion. Would the crew be able to toss her overboard at cruising altitude? Shouldn’t the plane have a bomb proof room to contain such passengers until landing? I suppose the scanning equipment at the airport would not be blamed except if doing so allowed for a more invasive form of scanning equipment to be rolled into place… for a nifty profit to some private security corporation. “…Operating from a Yemeni base near Aden, in the southern part of the country, the American troops are using satellite imagery, drone video and electronic intercepts to identify targets for a Yemeni offensive against the insurgents that has intensified this month, the officials said. Confirming what EW posted a week ago. As I commented then, F-15Es can carry really big 2000lb GPS and Laser-guided bombs compared to the 100lb Hellfire missiles on Predator drones, and this is a major escalation in US military involvement in Yemen. One particular speciality of the F-15E Strike Eagle, and something I rather doubt the Yemeni Air Force can do, is night ground attack strikes. Hitting folks when they’re encamped and asleep. My vote goes with all of these stories are fabricated and the USG can’t get their lies straight.